Making Baby Provence: SFT = Shot Free Tuesday!! Yesterday, I did my last Ganirelix shot in the morning. I forgot to post a picture earlier of the equipment needed for the shot. J It’s much easier than the Repronex because it’s already mixed and in its own vial. Basically, it just takes 2 cotton balls (1 for cleaning the injection site and 1 for rubbing the site after the shot), 1 Band-Aid, alcohol, and the shot. 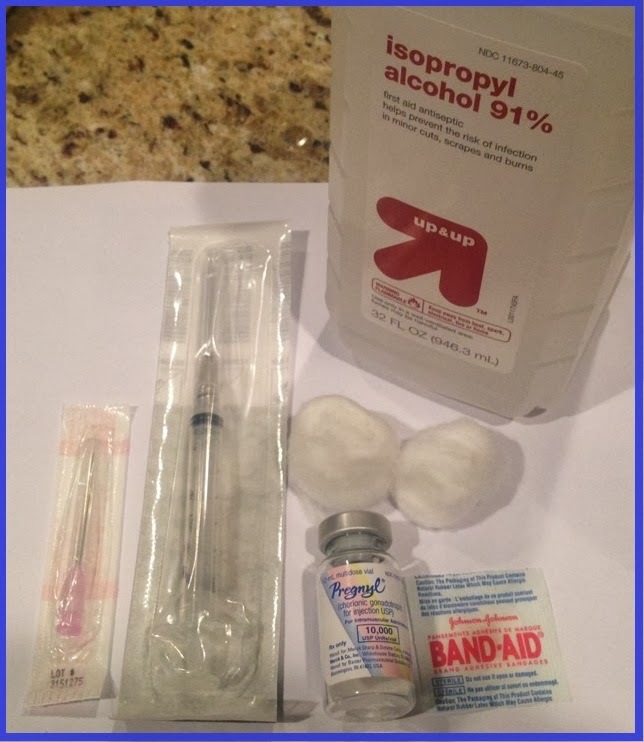 Last night, we did the one and only hCG trigger shot, Pregnyl. Mary Kathryn mixed it for us yesterday at the doctor’s office because they have had patients mix it incorrectly and basically ruin a cycle. Todd had to inject this one because it was intramuscular, meaning it went into my rear (same location the Progesterone shots will be administered). Mary Kathryn actually drew smiley faces on both sides for him, so he would know where to shoot. That keeps him from hitting bone. Ouch! I would say it’s an easy on my shot scale because it felt like a mosquito bite for a split second and then nothing else. I did heat before and after to make sure it was easy, but I don’t even think that was necessary. This shot will basically trigger me to ovulate right one time. It had to be given at 10 p.m. last night because our retrieval is tomorrow at 9 a.m. It’s amazing how they have figured all of this out! Since MK mixed it for us, the administering was pretty easy. 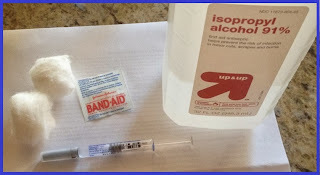 We used 2 cotton balls (for same reasons as above), 1 Band-Aid, alcohol, the 18 gauge needle for drawing the medicine from the vial, the 22 gauge needle for injecting, and the vial of medicine. As I said, our retrieval is tomorrow morning at 9 a.m. We are going to Bennett Fertility Institute (BFI) in Oklahoma City for this step, again. Therefore, we will be leaving around 6:30 a.m. I’m pretty excited, though, because I’m not allowed to wear hair products or make-up. That makes my morning much easier and not quite as early! I’ll do my best to do updates throughout the day. We will not know anything about the egg quality tomorrow. We’ll figure out how good they were about Monday when we get the final grade on the embryos. However, I will get daily updates from MK about their growth starting on Thursday. Tomorrow is out-patient, so we will be home and cuddled in bed tomorrow afternoon. I’m cheering on my eggs right now and praying they are great quality! I will be praying and thinking of you all tomorrow!!! Can't wait to hear updates! Fingers crossed! Love you both! Thanks, friend! Love you, too!! Just sending so much love and positive thoughts your way that you should feel giggly. Thanks, Mom! That made me smile! !